The Ecrins Massif (or mountain range) culminates in the summits of the Meije (3983m) and the Ecrins (4102m). 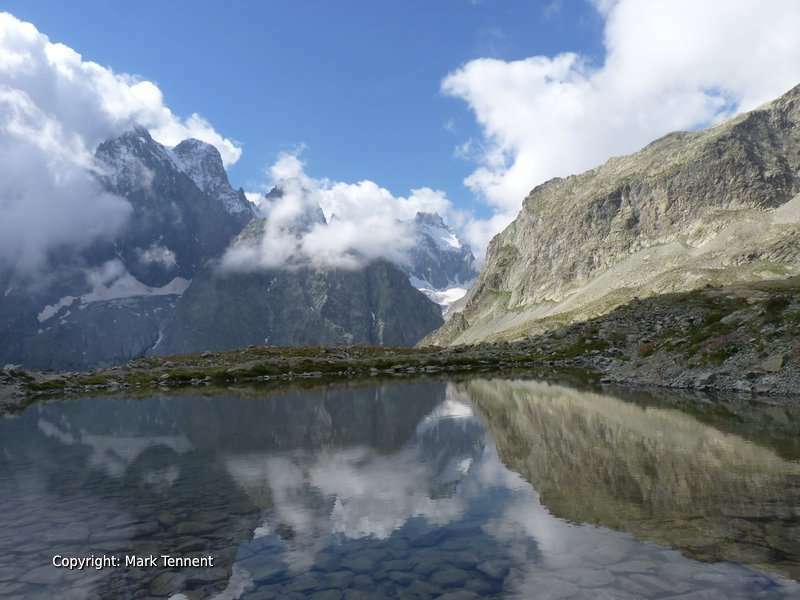 The Ecrins National Park was created in 1973 ten years after that of the Vanoise National Park. 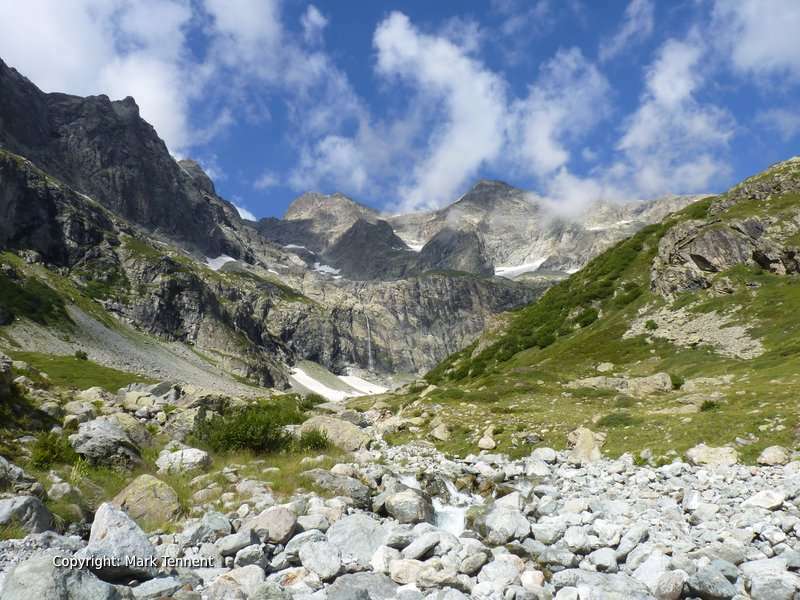 The Ecrins retains a wild feel due to it’s complex geology, with numerous deep valleys. These valleys are relatively hard to access and so have kept their charm unspoilt by creeping commercialisation. 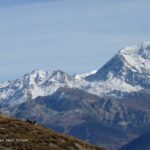 This tour with seven walking stages, nine days in total passes through majestic mountain scenery including high mountain passes and the valleys of the Oisan, Brianconnais and the Valgaudemar. 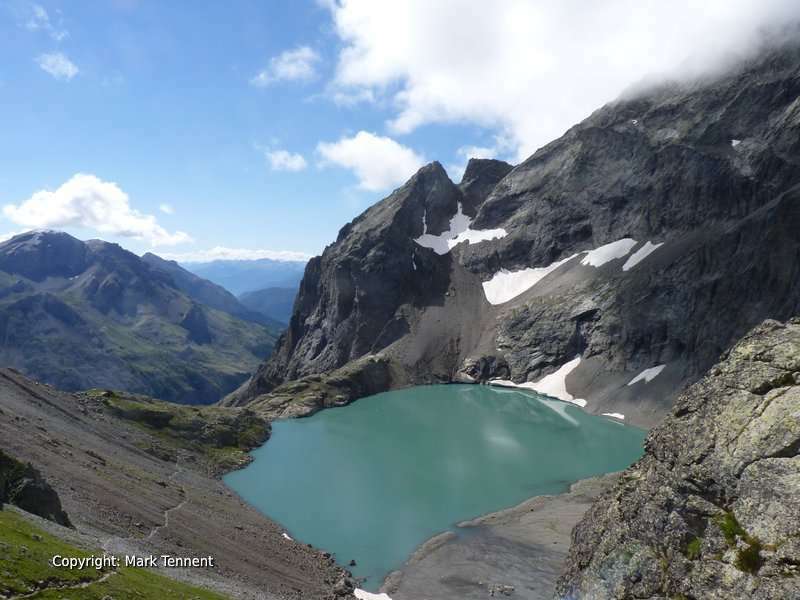 The Ecrins culminates in the summits of the Meije (3983m) and the Ecrins (4102m). The park was created in 1973 ten years after that of the Vanoise National Park. 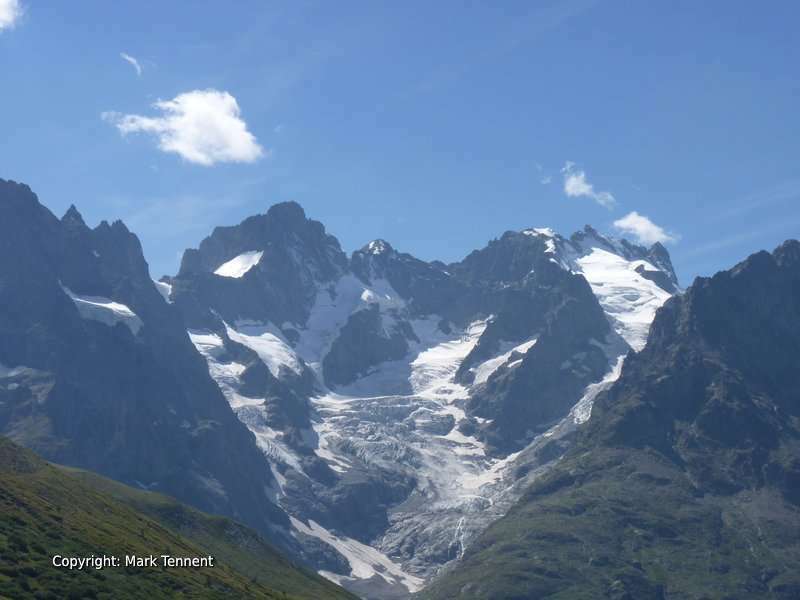 The Ecrins retains a wild feel due to it’s complex geology, with numerous deep valleys. These valleys are relatively hard to access and so have kept their charm unspoilt by creeping commercialisation. 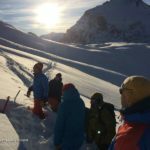 This tour stay requires a good physical endurance with stages of up to 8 hours walking and up to 1550m of cumulative ascent. This physical effort is rewarded with staying, except for one night, in comfortable valley based accommodation. Day 1 – Arrival. Overnight in hotel at Briancon. Day 2 – Les Combes (1853 m) – col de la Trancoulette (2293 m) – col de Vallouise (2589 m) – Vallouise (1160 m). Depart from Briancon for a short transfer to the hamlet of Les Combes. From here we climb through the Partias nature reserve to reach the Col de la Trancoulette. 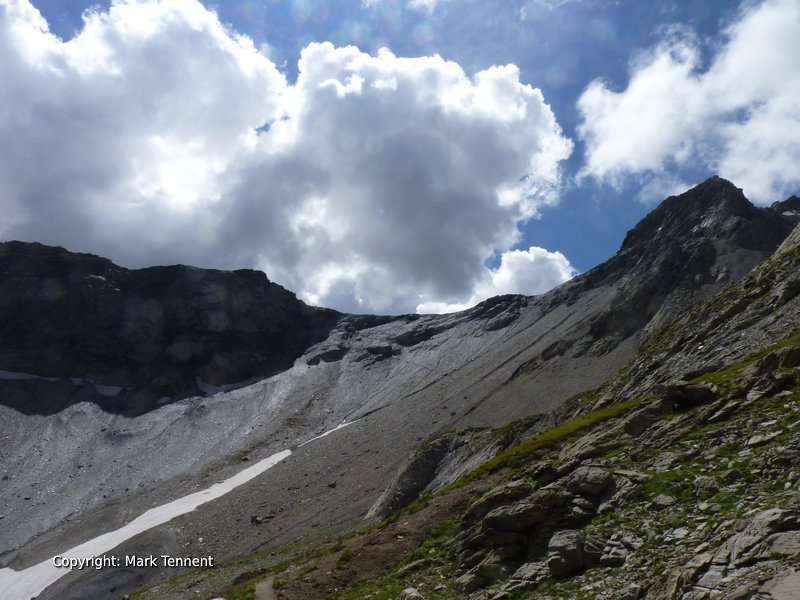 The path passes close to glacial moraines and the alpine pastures of the Peyre du Fey to reach the col de Vallouise. There’s a superb view from here to the Pelvoux and the Barre des Ecrins. Overnight in Vallouise. Hotel. Walking time: 5h 30. Ascent 730m Descent 1160m. Day 5 – Villar-Loubière (1050 m) – col de la Vaurze (2500 m) – Le Désert-en-Valjouffrey (1255 m) – transfer to Valbonnais (800 m). A brief transfer takes us to our point of depature Villar-Loubiere from where we head up for the col de la Vaurze. A well marked path climbs steadily in zig-zags to the refuge des Souffles (1968m) with a great view of the valley left behind us. The next section our eyes are drawn to the Olan before descending to to Desert-en-Valjouffrey. Transfer to Valbonnais. Overnight in hotel. Walking time: 8h00. Ascent: 1550m Descent: 1250m. Day 7 – Transfer to Besse-en-Oisans (1550 m) – plateau d’Emparis – Villar-d’Arène (1660 m). After a transfer to the village of Besse-en-Oisans we head for the plateau d’Emparis with unforgettable views of the North Face of the Meije. Reaching La Grave a short transfer takes us to Villar d’Arene. Overnight in hotel. Walking time: 7h00; Ascent: 700m; Descent: 600m. 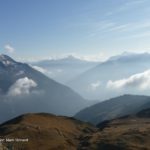 Day 8 – Pont d’Arsine (1670 m) – col d’Arsine (2340 m) – Le Casset (1512 m). 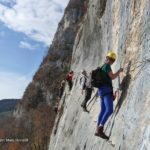 The route initially follows the wooded banks of the Romanche river before climbing up through the alpine pastures to the col d’Arsine. The Agneaux and its glaciers are the source for the Tabuc which meanders in the meadows. A final descent takes us to Casset and the end of our tour. Walking time: 5h 30; Ascent: 800m; Descent: 850m Overnight at Briancon. Day 9 – Transfer to airport / railway station. The following is a summary of the tour informaiton. Min / Max Group size: 2 – 8 (Private group departures at your convenience, please contact me). Huts (shared dormitory type rooms); Hotels (twin rooms). Huts: including dinner, bed and breakfast, picnic lunch, showers. Hotel accommodation: including dinner, bed and breakfast, picnic lunch. Group transfer picking up from Geneva airport and Chambery railway station. 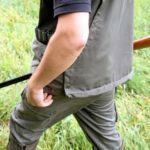 Insurance – please see the links page.